Well Perry and I had a great weekend away. I must admit the first 24 hours was a little hard. We kept thinking we would be doing this or that with Aaron. As you can see we the following pictures Aaron did just fine. It was a cold weekend so Perry and I went to a little candle factory and we went and saw the newest James Bond. We also did our Christmas shopping at the outlets. Then back home. Did I mention that Aaron loves baths. 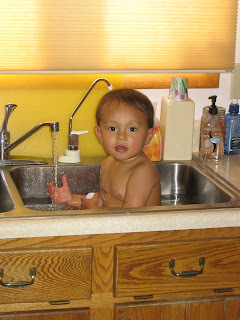 Grandpop and Abuela don't have a tub so this how Aaron takes a bath. I understand that he kept wanting to go to the sink. 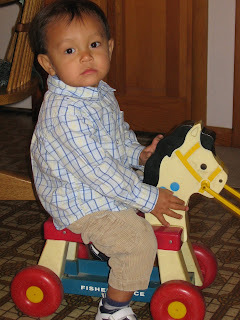 He also learned how to ride the horsey. It is hard to believe that this horse is almost as old as me. I am not telling you how old it is or how old that I am. 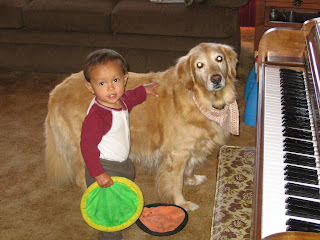 Tina and Aaron are great playmates and Aaron has learned to blame Tina for his troubles. I am thankful Tina is a tolerant dog. Well a great weekend was had by all. Thanks Abuela, Grandpop Aunt Cindy and Uncle Jim and all who made this weekend possible. the first time without your baby is always kinda hard. even when anthony gets babysat now i cant help but wonder what hes doing. looks like he had a great time though! aaron looks so much older. his face has matured since the last time we saw him. hes getting to be a big boy! 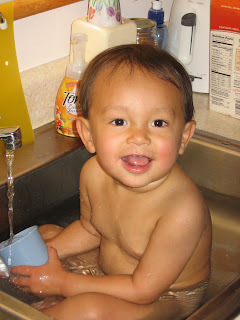 anthony would like to add, his bathtime in grandma's sink was very fun too!